Stephen Lamb grew up in Chattanooga, TN, where, at the age of nine, he begged his mom to let him take french horn lessons alongside the requisite piano lessons, instead of completing two years of study on the piano before expanding his interests like the rest of his siblings. By the end of high school he had added orchestral percussion and drum set and was playing with various groups around town, including his church orchestra, a couple of concert bands and community orchestras, the Chattanooga Youth Symphony (first on horn, and later on percussion), and a Salvation Army brass band. Surrounded by music, it was perhaps inevitable that he became interested in the art of orchestration and composition. He started buying orchestral scores to study, wondering how to make the brass section sound like that, and why cello, French horn, and oboe sounded so good together (Gustav Holst’s “The Planets” was the first score added to his library; Walter Piston’s and Cecil Forsyth’s identically–and succinctly-titled–Orchestration were the first technique books). He started writing arrangements for the musicians around him, including brass quartets, string quartets, woodwind ensembles, and full orchestrations. The week he turned 16, he was hired at a local Christian radio station as the afternoon disc jockey where he was able to pour over liner notes and listen through the music library, trying to figure out why some orchestrations worked better than others, and how to write arrangements that get at a song’s very essence. After auditing music classes at the local university his last two years of high school – a benefit of being home schooled, where he could adjust his schedule around his interests – he spent a year as a full-time music student, majoring in piano. He followed that with a 15-month stint at a school in Argentina, taking advantage of opportunities to write for the orchestral musicians there for chapel services and competitions, before returning to Chattanooga and getting a job in television production while continuing his orchestration studies. Around this time he also started working with other arrangers, inputting handwritten orchestral scores and string arrangements into Finale (the notation program he started using while in high school), learning the rules of engraving and how to make his scores and parts match published sheet music. In 2006, after a couple of years of weekly trips to Nashville for work projects and to attend a Tuesday morning score study group with other arrangers, he made Nashville his home base. 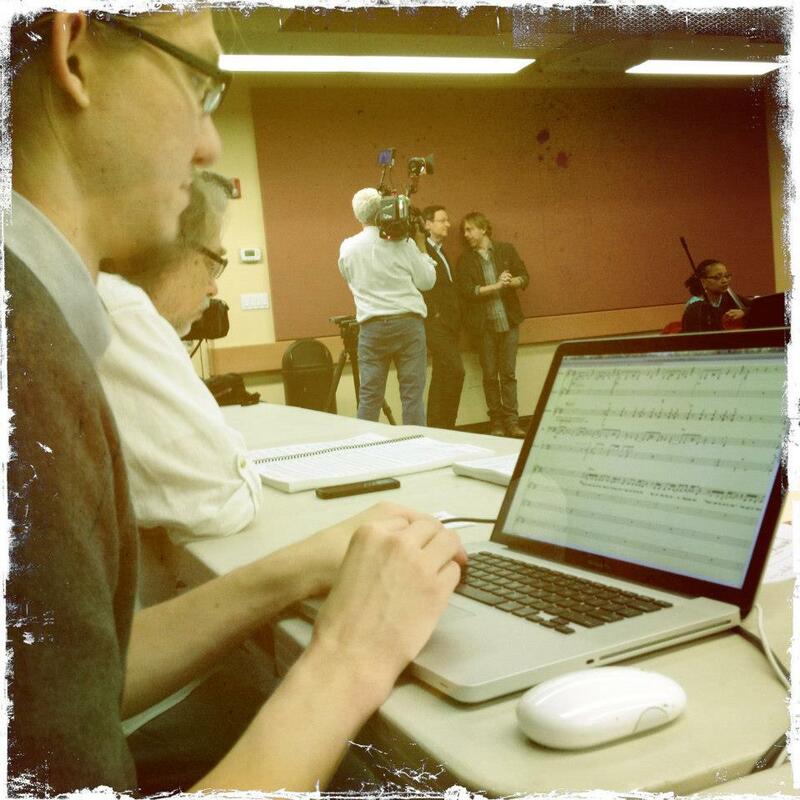 Diving into freelance work, one of his first projects involved orchestration, music prep, and work as a studio editor on the new Baptist hymnal with producer Greg Nelson for Lifeway, where over the course of nine months new arrangements and orchestrations were written and recorded for 600 hymns and 400 praise and worship choruses. Work as a studio assistant for the stage version of Disney’s High School Musical, music prep for a world tour by Dave Stewart (Eurythmics), and music prep and orchestration for CCM artists including Natalie Grant, David Phelps, and Casting Crowns soon followed, giving his career a solid start. Over the last decade, notable projects have included music prep and additional orchestrating for Michael McDonald’s 2013 orchestral tour; music prep and lead transcriber for the musical “Hands on a Hardbody,” that opened on Broadway in March of 2013, with Trey Anastasio (frontman of Phish) and Don Hart,plus a couple of orchestra tours with Trey and Don; music prep for Kristin Wilkinson for Martina McBride, Keith Urban, Lionel Richie and Allison Krauss, Vince Gill and Amy Grant, Lady Antebellum, and Reba McEntire; and music prep for Carl Marsh for Steven Curtis Chapman, Kathy Mattea, Marty Stuart, and Beth Nielsen Chapman.